The Life of a Gihr-Gihr. On a morning in May in Northern Kamchatka I walk towards the small group of reindeer-tents situated around a kilometer from the village of Achaivayam. I am doing fieldwork among the Chukchi, a group of indigenous people whose main subsistence is reindeer herding. Today is the day of the life sustaining spring-ritual, Kilvej. As I enter one of the tents the well-known mixed scent of reindeer and bonfire reaches my nose. 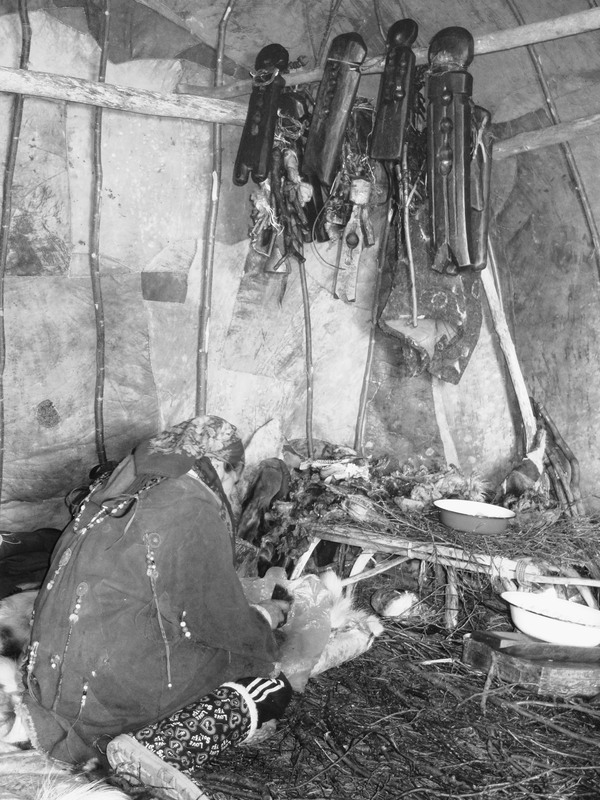 At the right side a sleigh is full of sacrificed meat and above it the family’s most sacred possession, namely the fireboards, which in the Chukchi language are called Gihr-Gihr. Everyone owning a reindeer also has his or her personal Gihr-Gihr. They are carved out as simple wooden people with holes in their stomach serving the purpose of fire making. The Gihr-Gihr, however, are far more than fireboards; they are living beings. In a very certain way they are the physical manifestation of the relation between living, ancestors and reindeer – because they are simultaneously the ancestors, the masters of the reindeer herd and the soul of their owners. This morning we are crushing reindeer bones. When they are crushed we boil them in order release the rich oil from the marrow. This is what we need because today is Kilvey, the spring feeding of the Gihr-Gihr, and fat is their favorite meal. Pleasing them and keeping them alive maintains a fruitful relationship between living and ancestors. It is explained to me in Achaivayam, that the precondition of any life is change, and that change is what we call death. 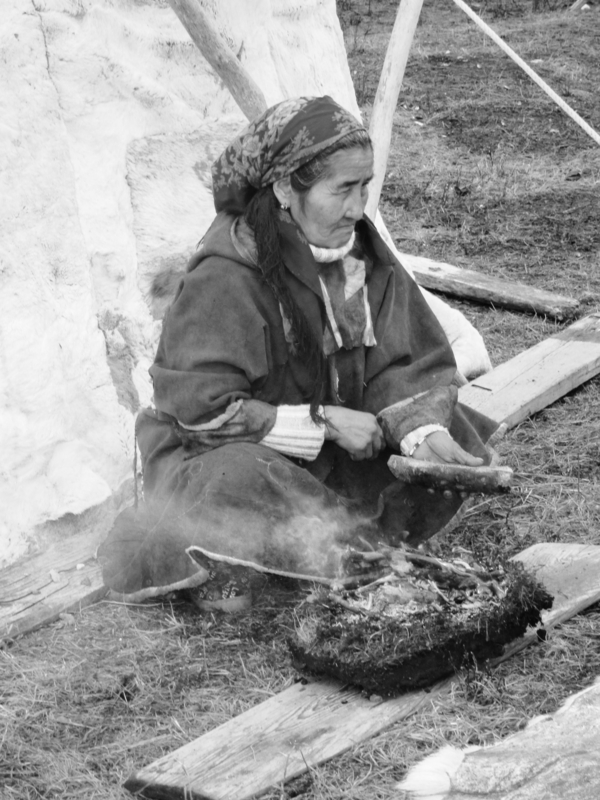 When a Chukchi person dies he or she is reborn among the ancestors and vice versa. The exact same pattern is true for the reindeer as well. There are, however, only a certain amount of Chukchi and reindeer to circle between the two worlds and both sides wish to have as many people and reindeer as possible. By throwing this feast on Kilvey, it is hoped that the ancestors will be so pleased that they allow the reindeer here to expand, which means that they will have to sacrifice some of their own reindeer in the ancestral world. When the oil has cooled down to a perfectly white mass of fat, family and friends show up to take part in the feeding. 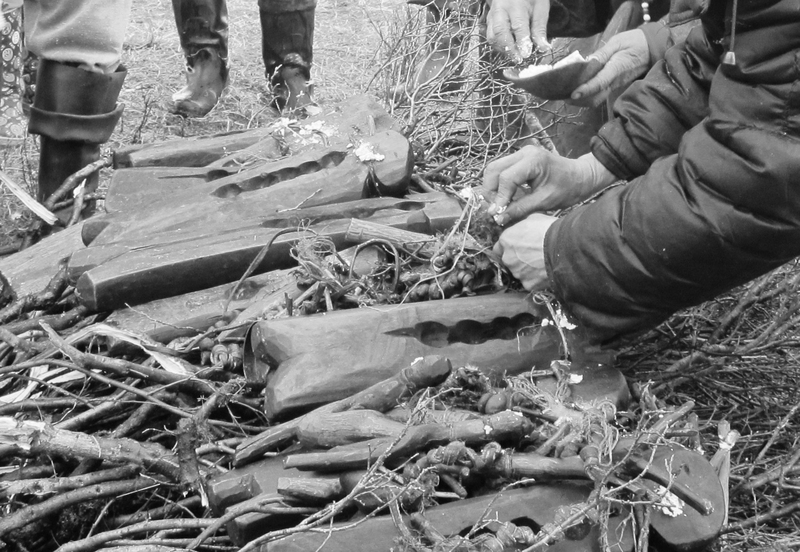 First, however, the Gihr-Gihr are used to make ritual fires as a way of keeping the life of the family going. The Gihr-Gihr of each family are then carried to the back of the tent where they are placed upon a bed of branches. Those branches in this moment substitute a reindeer-herd. The Gihr-Gihr and their connected family string of various charms and amulets are fed with fat. We then cover them with blankets of reindeer skin and leave them to spend the night outdoors. The ritual is almost over. The following morning the Gihr-Gihr are brought back into the tents and they are each given a small new lasso to aid in their reindeer herding. Hopefully they are content, because that means that the ancestors are content and may allow for a year with many born calves and plenty of food for them to grow strong. In return, the ancestors will receive plenty of reindeer through the Chukchi ritual reindeer sacrifices in autumn. Lets hope the Gihr-Gihr had enough to eat, because that is the next time they will be fed. I look at them. They look back at me with white fatty smiles and I take it as a sign that all went well. Jeanette was given the great honour to bring back two Gihr-Gihr to Moesgaard Museum, where they are currently exhibited, and she has personally taken on the responsibility feed the Gihr-Gihr every six months to ensure their continuous wellbeing. Photo of Gihr-Gihr: © 2014 Photo/Media Department of Moesgaard Museum.